The art installation, Old Growth (New/Now), returns wood utility poles to their origins as Douglas Fir trees. 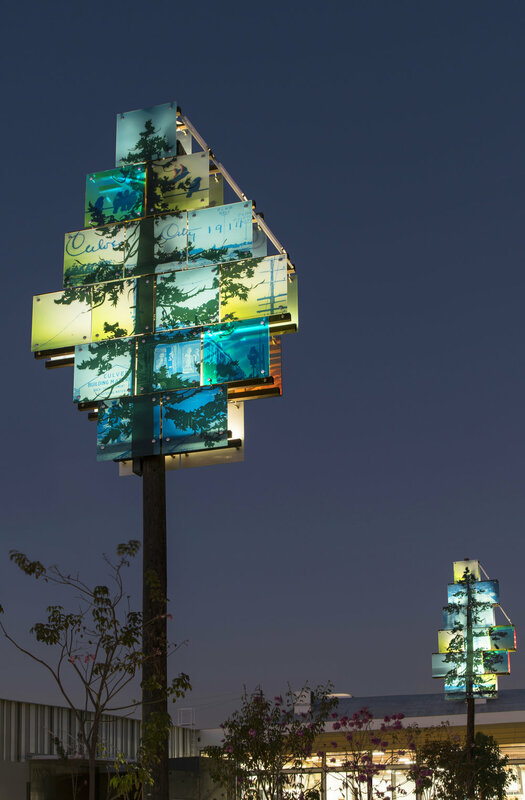 The art installation, Old Growth (New/Now) in Culver City, returns wood utility poles to their origins as Douglas Fir trees. The poles display glass panels, overlaid with historic images of the development of electricity and the surrounding community. Utility Poles, once a symbol of westward expansion and transcontinental connection, are slowly disappearing. As technology evolves, so does our perception of these objects. They now appear as holdovers from another era, antiquated but not yet quaint. The project looks ahead to a time when newer technology will diminish the need for utility poles. Once utility poles are replaced, our relationship with them, like acts of tossing shoes and posting lost dog flyers, will be nostalgic memories. The glass panels are illuminated by night with LED strips powered by solar panels - thus implying a future without poles.